(3 photos) I haven’t picked up my camera since I last travelled to New York City in mid-November. 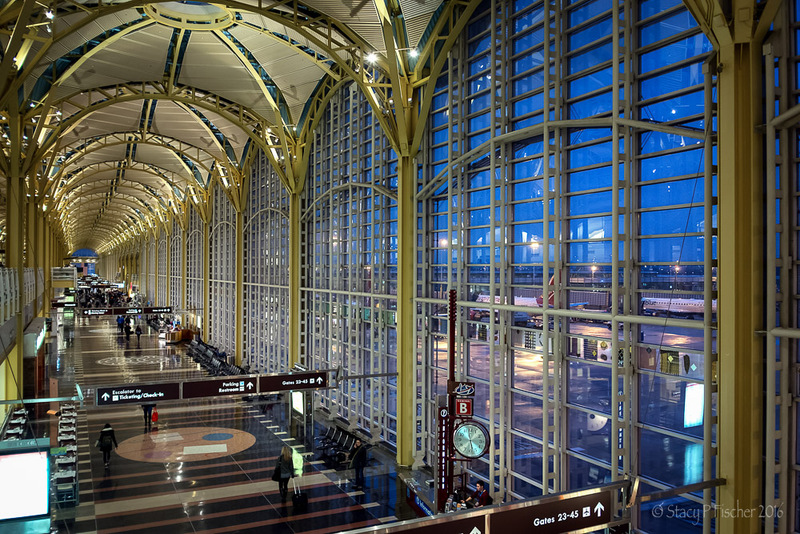 This past weekend, I finally broke free of my post-holiday lethargy and participated in an organized “photo safari” to Ronald Reagan National Airport in Washington, DC. 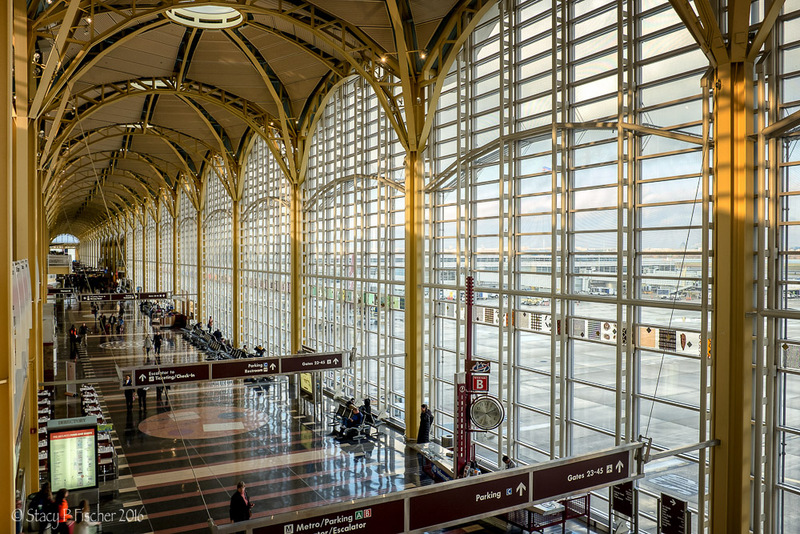 The benefit of the photo safari was that participants were allowed to use tripods, providing us the opportunity to capture the magnificent beauty of the interior of Terminal C.
A rare moment of sunlight on an otherwise grey, overcast day. For those in the DC area, check out Capital Photography Center and Washington Photo Safari for more safari offerings. 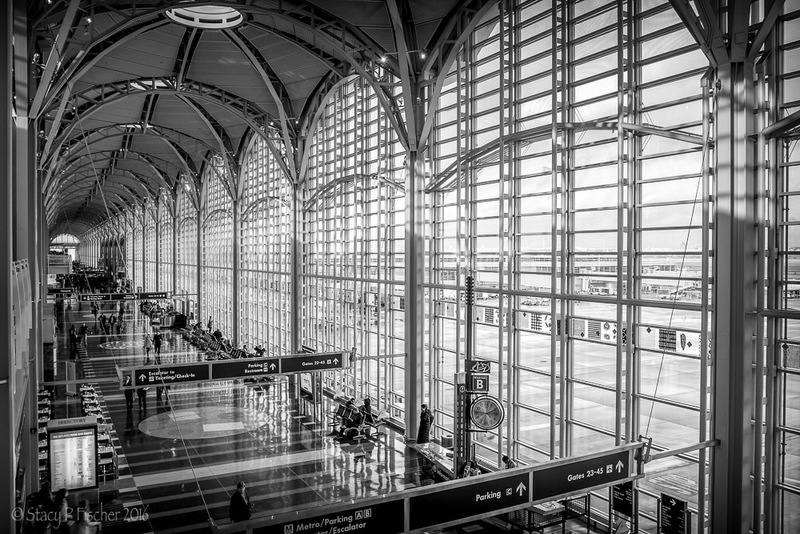 This entry was posted in Architecture, Black & White, Monochromia, Places, Washington, D.C. and tagged airport, architecture, Fuji X100T, photography, postaday. Bookmark the permalink. Beautiful. I prefer the twilight shot. Me too, Max 🙂 Thanks! I love your description, Su 🙂 It really is a magnificent building no matter the time of day or night but it was definitely a treat to be able to photograph it at twilight. Thanks so much! Spectacular shots Stacy, all stand outs. Great to see you back behind the camera, funny isn’t it how these things happen . . . Wonderful lines and light. I always love looking at your architectural pictures. Fantastic architectural shots, Stacy. Each has a unique personality. Glad you enjoyed your shoot! I do like this terminal. For some reason, I really like the color here better than the B&W. I would think this terminal would pop in Black&White, but there isn’t a focal point or a line to follow. Where with the color, for some reason, the design comes together. I imagine you can practice on snow pictures this weekend! Hope you’re snugged in. Or in Hawaii. Great food for thought, Lisa. Perhaps I kinda sensed this and that’s why I felt compelled to post it in color as well? I’ll remember that the next time I’m thinking of posting a “pair” and make certain I’m “seeing” the black and white without personal bias 🙂 Now, as for Hawaii, I wish! How about you? Are you all ready? Just answered on your food, coffee, wine, fireplace post. Pretty much as ready as I can be! Nice to get back out isn’t it? Golly! I’m speechless. But that doesn’t stop me. These are amazing. The architecture reminds me of older railroad stations. And though the black and white works well, I miss the gold! Great vantage point! You? Speechless? Nope, not gonna happen 😉 Yup, seems the gold is the defining factor of the photo, which should come as no surprise to me as that is truly what makes this terminal so striking! Lisa points out that she, too, prefers the color as it ties everything together unlike the B&W where there is no true focal point. Great feedback from both of you. Thanks for that! LOL! So weird to think it’s hot where you are, Raewyn, and we’re bracing for a blizzard. Not sure which I prefer 😉 Hang in there!